In late 1903, two young people from Ohio conducting an experiment that soon changed how we transport stuff and people faster yet cheaper. Orville Wright and Wilbur Wright crowned as the father of flying machine. Without these men, we may never undergo flying above the clouds. The Wright brothers have invented something important for our civilization for sure. 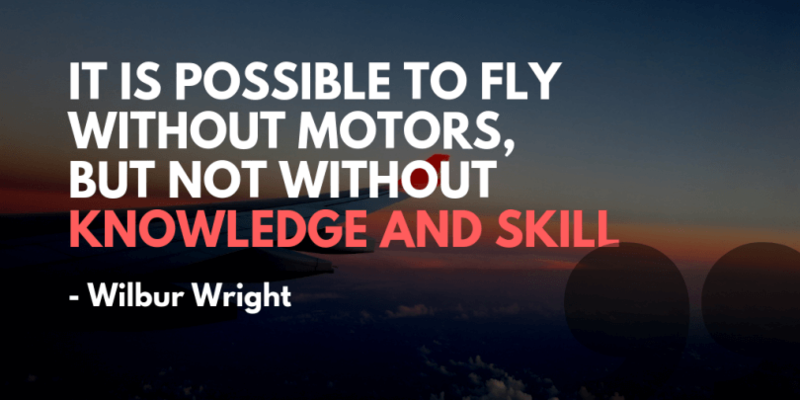 Here are 20 quotes from Wright brothers that actually helps them to create the world first sustained flying machine. The airplane stays up because it doesn’t have the time to fall. Isn’t it astonishing that all these secrets have been preserved for so many years just so we could discover them! We were lucky enough to grow up in an environment where there was always much encouragement to children to pursue intellectual interests; to investigate whatever aroused curiosity. In our gliding experiments, we had had a number of experiences in which we had landed upon one wing, but the crushing of the wing had absorbed the shock so that we were not uneasy about the motor in case of a landing of that kind. No flying machine will ever fly from New York to Paris… [because] no known motor can run at the requisite speed for four days without stopping. With all the knowledge and skill acquired in thousands of flights in the last ten years, I would hardly think today of making my first flight on a strange machine in a 27-mile wind, even if I knew that the machine had already been flown and was safe. The desire to fly is an idea handed down to us by our ancestors who, in their grueling travels across trackless lands in prehistoric times, looked enviously on the birds soaring freely through. With 12 horsepower at our command, we considered that we could permit the weight of the machine with operator to rise to 750 or 800 pounds, and still have as much surplus power as we had originally allowed for in the first estimate of 550 pounds. When the machine had been fastened with a wire to the track so that it could not start until released by the operator, and the motor had been run to make sure that it was in condition, we tossed a coin to decide who should have the first trial. Wilbur won. We could hardly wait to get up in the morning. I confess that in 1901, I said to my brother Orville that man would not fly for 50 years. There is no sport equal to that which aviators enjoy while being carried through the air on great white wings. More than anything else the sensation is one of perfect peace mingled with an excitement that strains every nerve to the utmost if you can conceive of such a combination. “I am an enthusiast, but not a crank in the sense that I have some pet theories as to the proper construction of a flying machine. I wish to avail myself of all that is already known and then, if possible, add my mite to help on the future worker who will attain final success. The desire to fly is an idea handed down to us by our ancestors who…looked enviously on the birds soaring freely through space…on the infinite highway of the air.